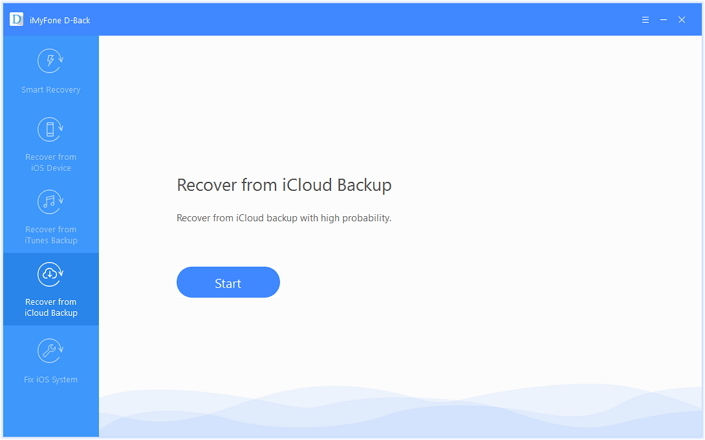 If you are in such a situation and you want to retrieve your notes from iCloud, then we have provided you with three recovery methods. The first and second way shows you what to do using iCloud and the third method will show you how to restore notes from iCloud using a third-party tool. The first method on how to restore your iPhone notes is to reset and restore your iPhone from iCloud. This method works if you are sure that the deleted notes are on your previous backup. Now here are basic steps. Step 1. On your iPhone search for “Settings”. Step 2. Next click on “General”. Step 3. From there, click on “Reset” and the “Erase all Contents and Settings”. Step 4. After that click on “Restore from iCloud Backup”. Step 5. 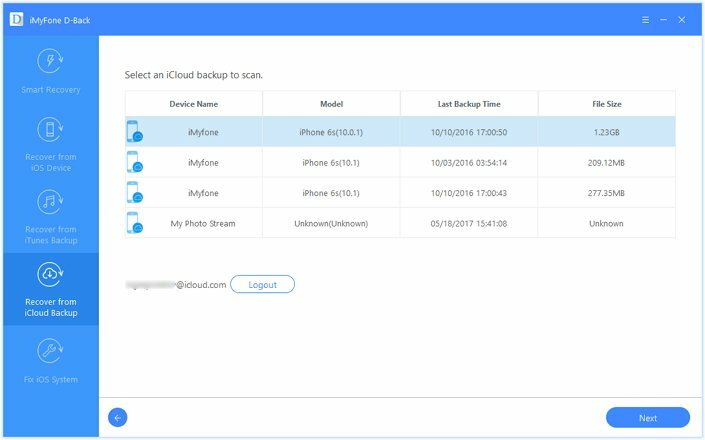 Choose the iCloud Backup account that has the deleted notes and download it. Be patient until the whole process is complete. Step 1. Visit https://www.icloud.com/ on your computer browser. Step 2. Log in to your iCloud account using your Apple ID. Step 3. All your files on iCloud backup will be displayed. Click on“Notes”. Step 4. Click on the notes to recover and then click on Email button. Step 5. Add your email address as recipient and send the notes. It is not at all cases that we accidentally delete or intentional delete our notes on iPhone and later need them back. In some cases your notes could disappear due to other factors such virus attack, upgrade failure or even resetting factory of your iPhone just to name a few. With any of these data loss scenario you can restore your notes effortlessly with iMyfone D-Back iPhone data recovery or iPhone data recovery for Mac software. This software not only recovers notes but also videos, calendars, messages, photos, voice memos, App history and others from your iPhone, iPad or iPod. 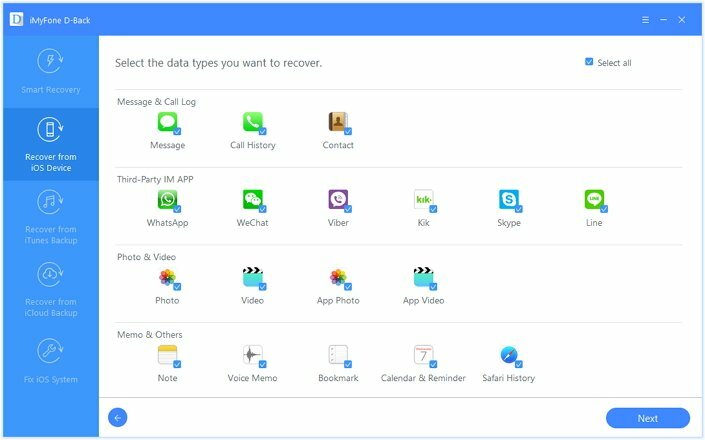 It is a software that supports a wide range of data loss scenarios like deletion, lost phone, damaged phone, virus attacked, iPhone jailbreak, iOs upgrade and many more. 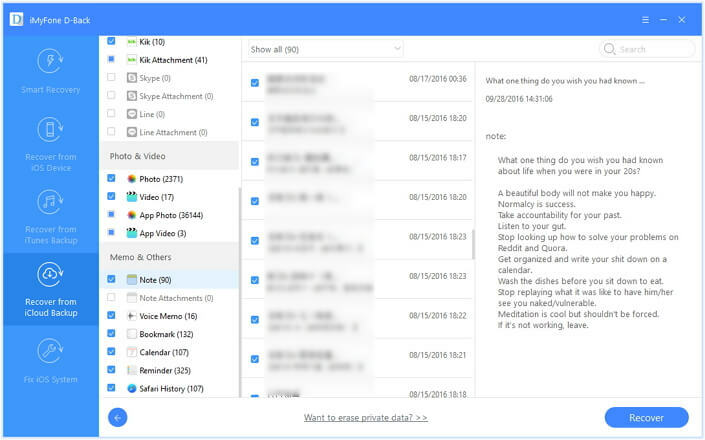 It is a comprehensive software that supports more than 22 data types like messages, photos, videos, Third party IM App messages, Memos, Safari History, bookmarks, notes and calendar. Open the program once you have downloaded it and open it on your computer. You will see the four recovery modes. Click on “Recover from iOS”. To recover from iTunes click on Recover from iTunes and follow the prompts, same case to Recover from iCloud. After that, select the missing data types. Mark on Notes and any other that you want to restore. 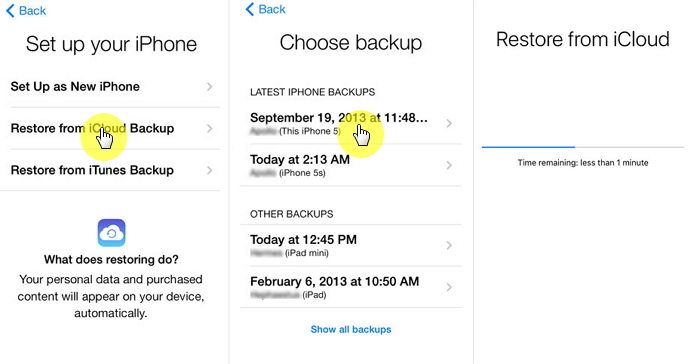 Log in to your iCloud account and D-Back will find all the backup file in your account. Select the backup file that includes the notes you want and click on the “Scan” button to download the file from cloud. The recovered files will be shown on the screen of the program. Hover the cursor to Memos & others folder. Then Check on the notes that were recovered. Mark on the ones that you wish to restore and click on “Recover” button. That is all that is required of you, be patient while the files are being restored to your computer. In conclusion, it is good to protect you notes and have them with you always. A convenient method of making and saving notes is using Evernote app. Download iMyfone D-Back iPhone data recovery or iPhone data recovery for Mac on your phone and you will be free from all these cases on losing your notes since you can sync across all your devices.